Neve Maslakovic: The ARCs of RD&U have arrived! The ARCs of RD&U have arrived! There they were, a whole boxful, sitting on my doorstep. Because the box was addressed to my pen name, I knew what it contained immediately. The ARCs were here. 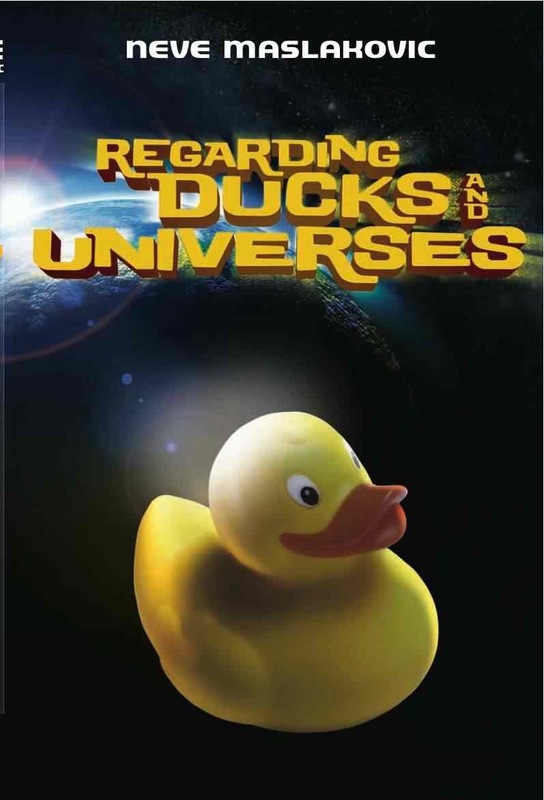 The Advance Reader Copies of Regarding Ducks and Universes, my debut novel. My six-year-old son ran to the box, opened it with some trouble, and exclaimed, "Mommy, did you write all of these?" In a sense I had. He soon figured out that they were all copies of the same book, chose one for himself, and carried it off to his room. I took one out for myself. The duck on the cover was perky and eye-catching. The text size and font inside were pleasing and easy on the eyes. And, best of all, the book had little ducks as section breaks! Once the initial excitement in the household had died down and I had taken pictures of the books with my iPhone and emailed them to family members, we moved the rest into my study. I noticed that on the front the copies had the words, "ADVANCE READER'S COPY - UNCORRECTED PROOF," alerting anyone who ventured further that the occasional typo was to be expected. I had already (virtually) put aside five of them for my Goodreads Giveaway. It's open till November 10 -- enter if you're interested in reading RD&U. 'Tis the tale of a cookware writer, his alter ego, and a wayward rubber duck. Starting tomorrow I'll be at the local Caribou Coffeehouse embarking on the final round of edits. Exciting stuff.